I’m lucky if there’s a few good Blu-ray releases worth considering for my column each week, let alone actually sent by the studios to review, but that’s definitely not the case with this week’s impressive haul. While I didn’t get copies of “John Carter,” “Breaking Bad: Season Four,” or many of the Universal and Disney catalog titles released, there was still plenty to choose from to make this edition of Blu Tuesday one of the best yet. It’s been a while since the last time I sat down to watch “The Sting,” but it shouldn’t come as much of a surprise that the movie still holds up remarkably well, especially now that it’s been digitally remastered as part of Universal’s 100th Anniversary Collector’s Series. Director George Roy Hill’s second collaboration with Robert Redford and Paul Newman epitomizes everything that made the 1970s such an amazing and transitional period for American cinema, beginning with David S. Ward’s Oscar-winning screenplay. While Hill does a great job making sense of the elaborate plot, and Redford and Newman replicate their wonderful chemistry from “Butch Cassidy and the Sundance Kid,” the film wouldn’t be such a timeless classic if it wasn’t for Ward’s smart and unpredictable script. From Newman’s poker showdown with Robert Shaw, to the climactic finale involving nearly every character in the story, there are so many memorable moments that it’s no wonder why “The Sting” remains as beloved today as when it was first released. It’s arguably the definitive con movie, and one that deserves a place in every film lover’s collection. Blu-ray Highlight: Although it’s appeared on previous editions, “The Art of the Sting” is an excellent three-part retrospective that features interviews with Robert Redford, Paul Newman and other cast and crew as they reflect back on making the film, including the choice to use ragtime music for the score, cast chemistry and anecdotes from the set. Science fiction has enjoyed a renaissance of sorts on television in recent years, thanks in large part to the advances made in technology. Unfortunately, many of the major networks haven’t had a lot of luck with the genre, which is why the idea of a smaller fish like TNT dipping its toes into the sci-fi pool sounded like a disaster waiting to happen. Perhaps best described as a mix between “War of the Worlds” and “The Walking Dead,” the show strikes a good balance between the action sequences and the human drama that occurs within the Resistance, even if the writing and acting aren’t necessarily of the highest quality. It’s obvious from the first episode that “Falling Skies” is working with a limited budget, but while the special effects are only slightly better than your average SyFy made-for-TV movie, they’re never a crutch to the series. Granted, it probably won’t blow you away, but for sci-fi fans still mourning the loss of shows like “V,” it’s a pretty decent substitute. Blu-ray Highlight: If you’re looking for a more in-depth conversation about specific episodes, then the included audio commentaries (five in all, featuring producer Greg Beeman, actor Noah Wyle and writer Mark Verheidan) are the way to go, but I enjoyed the footage of the “Falling Skies” panel from last year’s San Diego Comic-Con a little more. Though the panel isn’t available in its entirety, it features most of the cast (as well as a few of the producers) discussing the first season in a much broader capacity. 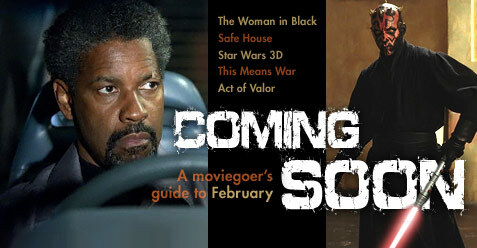 If I’m being completely honest, I don’t really remember “Safe House” all that well, but that’s part of the problem. Despite starring two of the most charismatic actors in the industry in Denzel Washington and Ryan Reynolds, the movie is pretty forgettable. The actors do the best they can with the material that they’ve been given, but despite some small changes to the formula, the film is just another run-of-the-mill action thriller with hardly a surprising moment throughout. One of the few things that does work in the film is the setting. In addition to boasting a variety of unique locations (like the newly built soccer stadium), Cape Town, South Africa is a fresh and exotic locale that Hollywood hasn’t filmed to death. There’s also a really great action sequence with Reynolds and “The Killing” star Joel Kinneman (who previously worked with director Daniel Espinosa on the Swedish hit “Snabba Cash”) that will likely go down as one of the best fight scenes of the year, but for a movie packed with this much talent, there should have been a lot more highlights than that. Blu-ray Highlight: There really isn’t a standout special feature on Universal’s two-disc release, but there are still a few good extras worth checking out, including a short but sweet making-of featurette that covers a range of topics like the script, casting and production; an in-depth look at the film’s fight choreography; and a featurette on ex-CIA operative Luis Falcon III’s assistance in making the movie as accurate as possible.